Over the last few years, we have had the great pleasure of shipping our matting to some of the most historic country clubs in the United States. Recently, we added another famous venue to our list: the Army Navy Country Club in Fairfax, Virginia. The facility manager for the golf course was looking to install some of our matting on the bridges around the course. Because our slip-resistant matting holds up well against high levels of foot traffic, it should—if properly maintained—last for several years. This will also help the facility crew keep a healthy maintenance budget. In case you were wondering, several U.S. Presidents have played this 54 championship hole course including: John F. Kennedy, Dwight D. Eisenhower, Lyndon Johnson, Richard Nixon and Bill Clinton. As you can see, the green color tone really blends well with the wooden floor boards, thus improving both safety and aesthetics. If you would like to see more photos of golf applications, please head on over to our photo gallery. 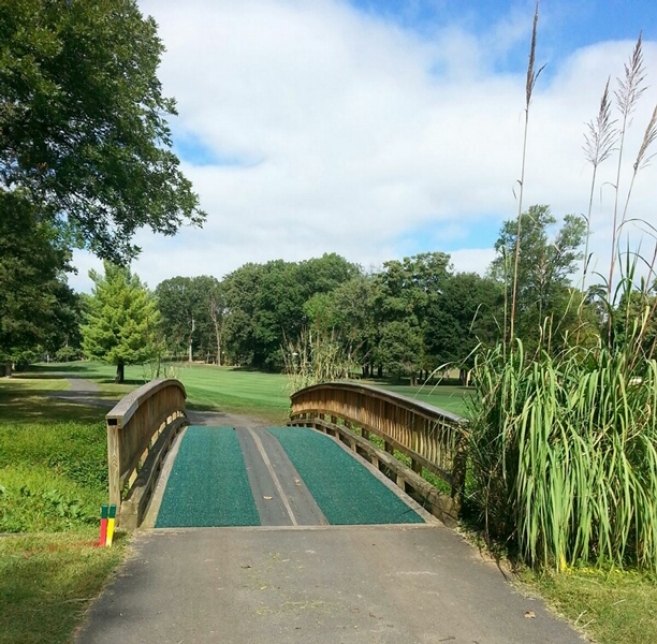 PEM Golf Course Matting is the perfect solution for cart paths, stairs, ramps, bridges and more. No matter the application—PEM matting will help keep you safe! To learn more about PEM slip-resistant matting, please feel free to give us a call at 800-783-2358 or email your questions to info@pemsurface.com.